(Updated on 21.05.18). 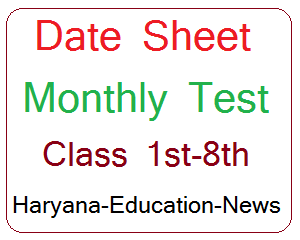 Latest Monthly Student Assessment Test Date Sheet class 1st to 8th for Haryana Govt. 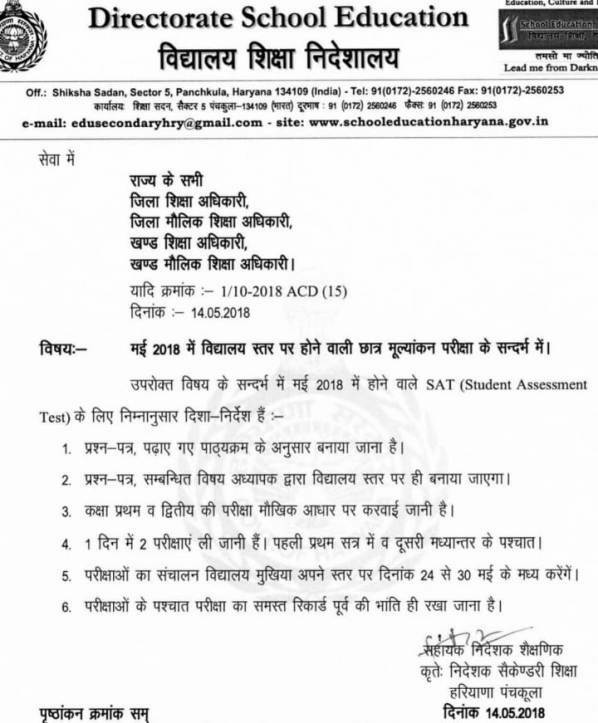 Schools for 2018-19 - Check SCERT Gurugram Schedule of Monthly, Half Yearly and Annual Assessment 2018-19 for classes I to VIII. This schedule includes CCE/CRA Marks & Assessment Marks of Monthly Test, Half Yearly Test & Annual Test March 2019 for classes 1st to 8th for 2018-19. The Department of School Education & Elementary Education, Haryana released CCE Schedule for the Monthly Tests for all students of class of 1 to 8 for the session 2018-19 which is available here as the schedule has been issued on the official website i.e. www.scertharyana.gov.in. The Department has made Headmaster/Head Teacher responsible for ensuring the smooth conduct of these tests. You can also download detailed plan/design of monthly, half yearly & annual assessment for class 1st to 8th for the academic session 2018-19 at the given below link. A total 4 Student Assessment Test (SAT) instead of 5 Monthly Assessment Tests will be conducted during the session 2018-19. 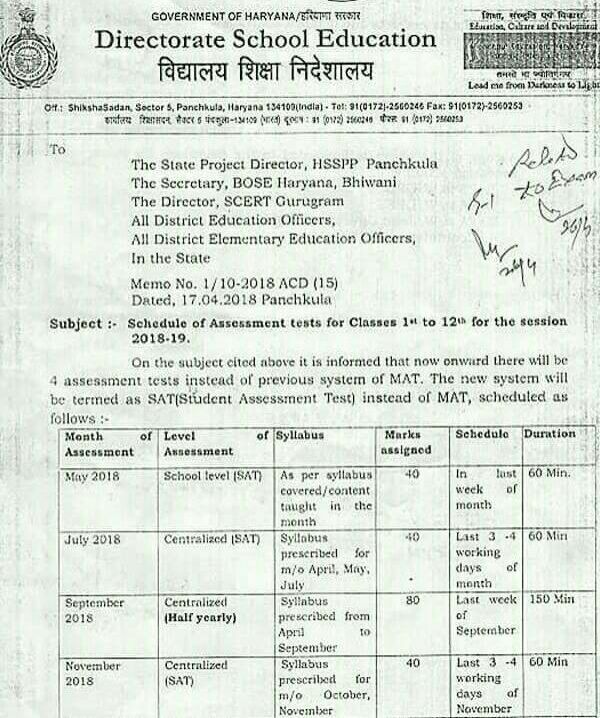 Out of these 4 tests, 3 tests will be conducted in the month of May, July & November, 2018 and Half Yearly Assessment Test (September 2018) will be conducted in September, 2018. Annual Assessment Test (March 2019) will be conducted and assessed by other than class/subject teacher. The detailed Date Sheet for 4 student assessment tests has been prepared by the Education Dept and SCERT and is available at the website of SCERT Haryana i.e. www.scertharyana.gov.in or DEE i.e. www.harprathmik.gov.in. View date-sheet here. Haryana Education Department has uploaded latest date sheet or schedule of half yearly test Sept. 2018 for class 1st, 2nd, 3rd, 4th & 5th. Half Yearly Test will be held in the last week of September. The detailed instructions regarding preparation of Monthly Tests, Half Yearly Tests & Annual Exams would be issued by the Department in due course of time. All the Heads of the schools (Govt. Middle School & Govt. Primary School) may be intimated accordingly.